Heritage Ireland 2030 is the Government’s commitment to a revitalised and refreshed National Heritage Plan. "He who controls the weather controls the World" ... 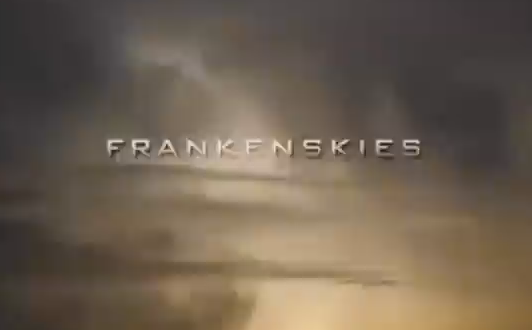 This video explores the attempts over the last six decades to modify the Earths weather. One such project - "Project Stormfury" - was an attempt to weaken tropical cyclones by flying aircraft into them and seeding with silver iodide. The project was run by the United States Government from 1962 to 1983. The hypothesis was that the silver iodide would cause supercooled water in the storm to freeze, disrupting the inner structure of the hurricane. This led to the seeding of several Atlantic hurricanes. However, it was later shown that this hypothesis was incorrect. The last experimental flight was flown in 1971, due to a lack of candidate storms and a changeover in NOAA's fleet. More than a decade after the last modification experiment, Project Stormfury was officially canceled. Although a failure in its goal of reducing the destructiveness of hurricanes, Project Stormfury was not without merit. The observational data and storm lifecycle research generated by Stormfury helped improve meteorologists' ability to forecast the movement and intensity of future hurricanes. 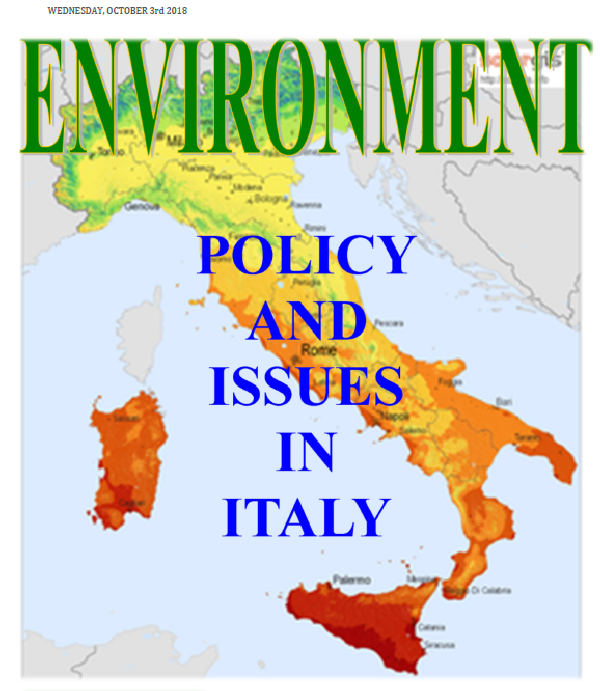 Produced by our interns here at FFI this report ( pdf download ) investigates environmental and health challenges facing Europe today with a focus on environmental policy in Italy. The report was produced by Giovanni Battista ANGRISANO, Francesca FERRARO Giovanni Lorenzo ORLANDO and Antonella VICECONTI, supervised by John HAUGHTON of Forest Friends Ireland and facilitated by Concetto LA MALFA. We had a letter over the weekend from a reader regarding Luggala in County Wicklow. The 18th century house and almost 5,000 acres of land are for sale at an asking price of €28,000,000 and the sale is raising concern on the protection of and access to this spectacular area of natural beauty and heritage.
" I am writing to you looking for your organisations support in a very important cause- That a large area of very important natural habitats in Co.Wicklow (part of Luggala Estate) become part of The Wicklow Mountains National Park. Eamon de Buitlear once said of Luggala that 'you can find nearly every animal that lives in Ireland in Luggala'. It holds a number of very Important habitats, lake and river, ancient oak woods, wild valleys, heather moorland and wild grassy meadows. There are few places where it is possible to watch otters on a lake or river, then stroll through ancient oak woods covered in bluebells listening to woodpeckers, then watch grouse on heather moorland and falcons swoop by cliffs all in about 1hrs walk. The 5000 acre Luggala estate is for sale on the open market and future public access is threatened. It is my opinion and that of The Wicklow Mountains National Park that a sizeable portion of the estate lands (National Parks recommend 4000 out of 5000 acres) be purchased by the State to become part of The Wicklow Mountains National Park, which would protect the flora and fauna and allow the public access to enjoy the place. I have started a petition for this, it is mainly worded on the grounds of public access although obviously with the idea that the National Parks would own it, its valuable habitats would be protected." Forest Friends Ireland believe this is a worthy cause and urge all our members and readers to sign and share the petition at change.org. 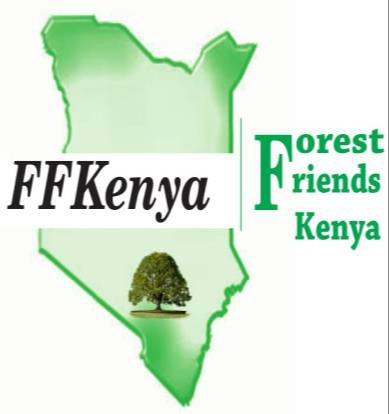 Forest Friends next project is the planting of 8,000 trees in the border counties to celebrate the births of children born in the border counties in 2016. For this project we need access to land and to source the trees. 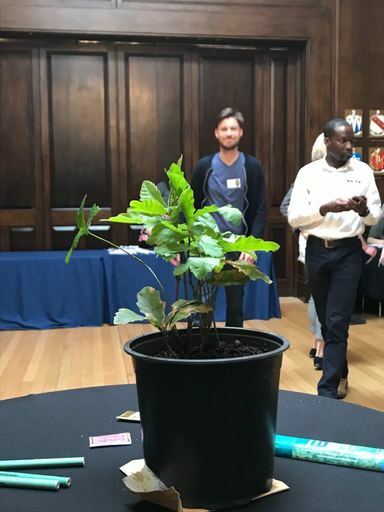 The trees can be planted in one or many sites and residents and communities in the border counties can plant and register the trees they plant. 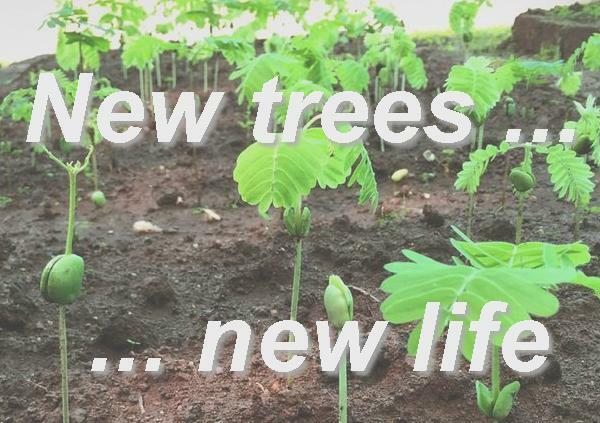 We plan to register all plantings for this initiative for future generations. We look forward to many years of fruitful collaboration. 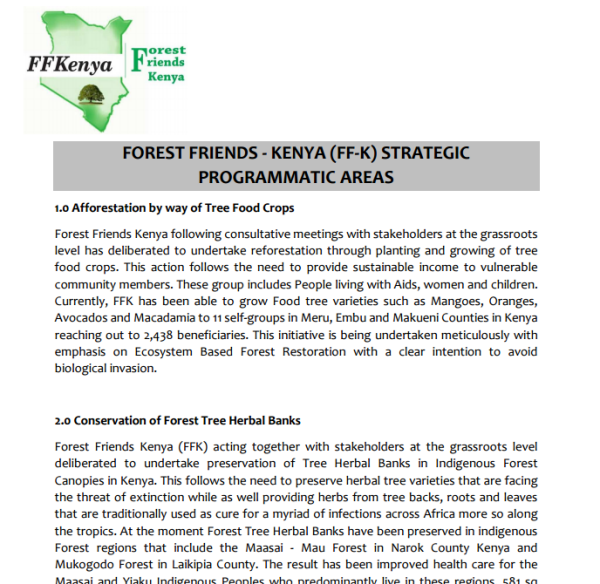 Please follow the link below for more info on the Forest Friends Kenya strategy. A few people have been asking what connection did Brendan Behan have to trees. Well he had the most wonderful connection to our native Irish language which he loved more than anything else and expressed his poems and plays in that language. Also the Celts developed the Ogham alphabet where each letter was a tree and when they talked they were talking trees. This is such an important part of our culture and it is appropriate that we celebrate the works of Brendan Behan on culture night 2018. Our language in all its richness was stolen from us and was appreciated by many who have studied it. So, for example the playwright Johnathan Millington Synge was so impressed by the native speakers that he went and learned the language so that he could experience it. He said that listening to the native speakers was like listening not to language but to song. Claddagh Design have created a beautiful overview of the ancient Irish alphabet Ogham which you can read at their website here. 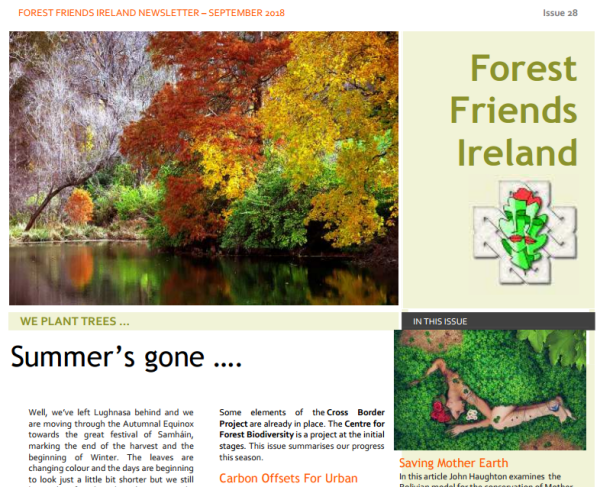 We have written here on forestfriends.ie in the past on the close links between Irish heritage, tree names and Ogham. This topic is also covered in some detail over at The Celtic Journey. 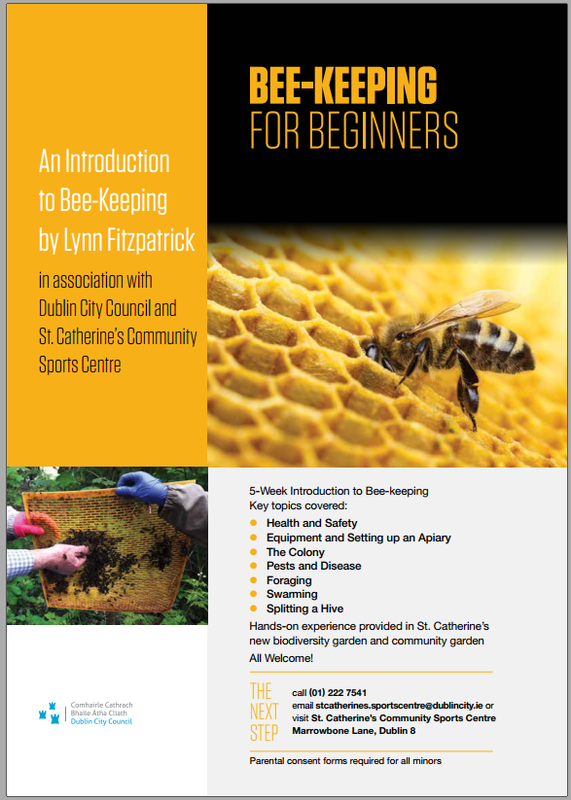 A fascinating subject we may return to in more detail here at forestfriends.ie. FFI Culture event Friday 21st September. 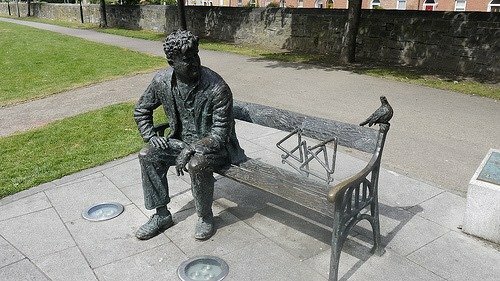 Brendan Behan is one of Ireland's greatest writers and has not been given the attention he deserves. 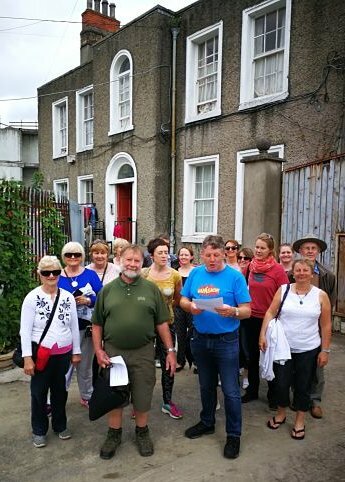 We plan to have a festival on Culture day/night highlighting what is written in bronze on his seat at the Drumcondra end of the Royal Canal, which is a fitting tribute to him with music, song an poetry - a full extravaganza. Brendan Behan's lifestyle has unfairly been the main focus of his life and quotes like "I am a drinker with a writer problem" often come to the fore. But Brendan moved in the highest literary circles in Paris, rubbing shoulders with the best. He loved his native language and the Gaeltacht areas of the West of Ireland. Much of his writings are in Irish and have not yet seen the light of day. By culture night, we will have trawled though the archives so that his great hidden works can see the light of day at long last. Brendan was a product of Dublin's North Inner City and we will call on the locals to come and express their feelings about Brendan and to pay fitting tributes in music, song and poetry. On that night the Old Triangle will once again go jingle jangle. Project Phase Launch - May 15th. 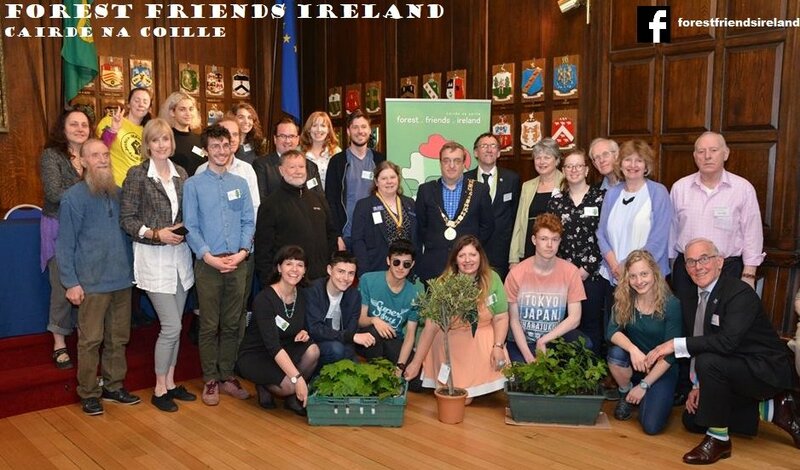 Last Tuesday, a new vision for a world peace tree center for Ireland was launched involving a partnership between Forest Friends Ireland and Rotary Dublin North at the Mansion House in Dublin. 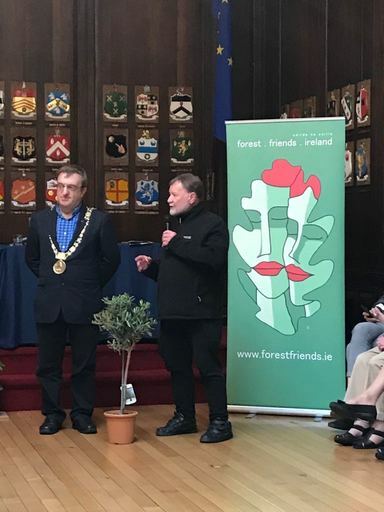 Phase two of the Peace Forest Ireland project was launched by Ardmhéara Mícheál Mac Donncha at 12.45pm in the appropriately named Oak Room. 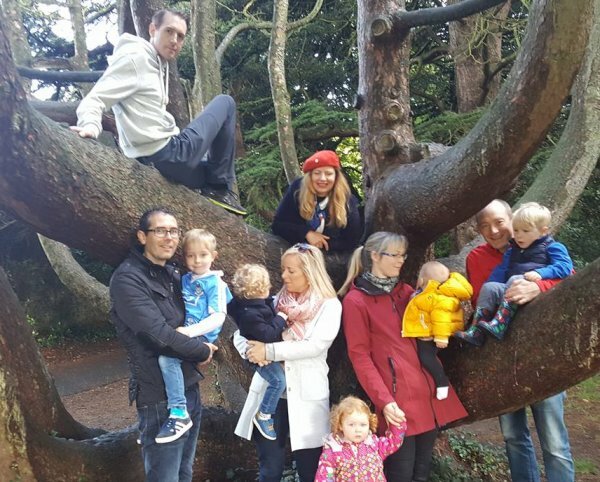 Ardmhéara Mícheál Mac Donncha pointed out that phase two of the project involves a “new vision for a World Peace Tree Centre for Ireland involving a partnership between Forest Friends Ireland and Rotary. John Haughton founder of the Peace Forest Ireland Project and chairperson of Cairde na Coille/ Forest Friends Ireland stated: “Since our original launch of phase one in 2013, we are now discussing an ambitious plan to create an international Peace Centre based on the international Auroville Peace Centre located in Tamil Nadu, in the south-east of India, which we recently visited. This would involve creating a new world peace centre in Ireland’s border counties, embracing the ethos and ecology of tree and forest. Auroville is a proven model which can be easily replicated given sufficient lands and finance and the involvement of the private and public sectors”. During the launch there were presentations from James Comiskey, Landscape Designer and partner of the project. 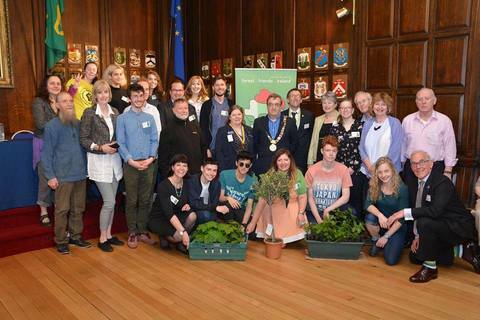 James is ‘currently Ireland's youngest person to hold an award from the Royal Horticultural Society,’. He gave a motivating presentation on the topic of the Peace Forest Ireland project, its historic perspective, achievements to date and ideas for the future. Next was Lycia Trouton, a Conceptual Artist from Belfast now living in Canada with a presentation on peace-building, and on her own project"The Linen Memorial". Also on the day, there were speeches from Rotarians, Monica Robertson (DGE), Jack Kinane (President of North Dublin Rotary) and Jason O'Connell (President of Raheny Rotary). Following the launch, a native Irish Hazelnut tree was planted in Griffith Park, Drumcondra in memory of Stephen Coyne founder member of Forest Friends who passed away recently and Liga, partner of Andrew Jordan, Forest Friends director who recently lost her life tragically while attending a healing event in Kerala, India. 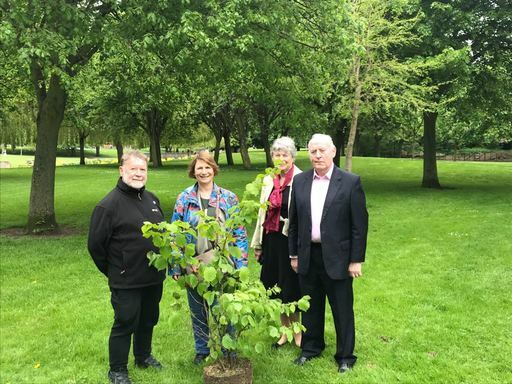 The tree was donated by Sylvia Maxwell and the plot of parkland was kindly offered by Dublin City Council. The Peace Forest Ireland began as a concept and was quickly transformed into a project year on year. Now it is gathering momentum. You can read our 2017 progress report and future plans in our November Project Report [pdf]. 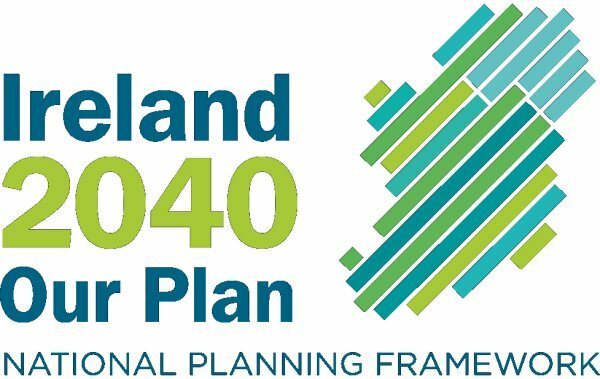 The National Planning Framework (NPF) [ link -> ] is a national plan to guide and shape the spatial development of Ireland. The plan seeks to provide a spatial expression of government policy and provide a decision making framework from which other plans will follow. This is an important development and Forest Friends Ireland have made a submission regarding several aspects of the plan. You can read the FFI submission from this link. Forest Friends Ireland are held a "tree hugging" event at the Arts and Business Campus, Drumcondra, on Culture night 22nd. September 2017 in remembrance of the very first tree huggers, The Chipkos. The word Chipko, is a Hindi word meaning "hugging", is used to describe a movement whereby local village women literally "hugged" trees, interposing their bodies between the trees and the loggers to prevent them being cut down. It has come to describe an important historical event in the fight to secure women's rights, in the process of local community development through forest and environmental protection. Khejarli or Khejadli is a village in Jodhpur district of Rajasthan, India, 26 kilometres (16 miles) south-east of the city of Jodhpur. The name of the town is derived from Khejri (Prosopis cineraria) trees that were once abundant in the village. In this village 363 Bishnois sacrificed their lives in 1731 AD while protecting green Khejri that are considered sacred by the community. The incident was a forebear of the 20th-century Chipko Movement. In September 1731, a royal party led by Giridhar Bhandari, a minister of the maharajah of Marwar, arrived at the village with the intention of felling some Khejri trees that were sacred to the villagers. The trees were to be used in the construction of a new palace. A local woman called Amrita Devi Bishnoi protested against the tree-felling because such acts were prohibited by the Bishnoi's religion. She and her three daughters (Asu, Ratni and Bhagu) were then killed by the party. News of the deaths spread and summons to a meeting were sent to 83 Bishnoi villages. Villagers of all ages began hugging the trees that were intended to be cut and were killed. The development shocked the tree-felling party. The group left for Jodhpur with their mission unfulfilled and the Maharaja Abhai Singh of Marwar subsequently ordered that no more trees should be felled. 363 Bishnois laid down their lives for their trees. The Chipko Movement spread from one end of the Himalayas in Kashmir to the other in Arunachal Pradesh, with the aim of affecting the Government's forest policy by insisting on maintenance of the traditional status quo in the Himalayan and other forest regions of India. It was based on Gandhian peaceful methods. This is the photo of our heritage week event. These were the people who attended the heritage walk. The photo is taken at the house of Tom Clarke who was one of the leaders of the 1916 Rising. His house is one of only two remaining of the houses of the leaders. In the photo the man in the blue t-shirt is reading the 1916 Proclamation. The video below has some imagery of deformity resulting from the of the use of the herbicide "agent orange" which some viewers may find disturbing. Jonathan Ellis Armagh Banbridge Craigavon Parks Manager and staff, John Haughton Peace Forest Ireland, Councillor Freda Donnelly (DUP), Councillor Sam Nicholson (UUP). The Peace Forest Ireland Project involves the creation of a peace forest stretching all along the border counties north and south Ireland. It involves bringing communities together to better understand the cultural diversity and biodiversity of the various communities. Today work on the tree planting is progressing with the welcome participation of the localcommunity. Our photographs show Rev. 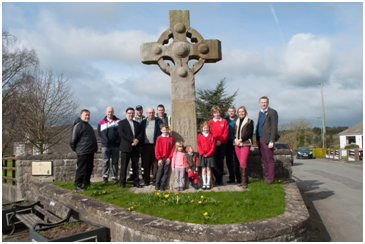 Matthew Hagan who is Chairperson of the Tynan Development Committee, along with residents, pupils and staff of St. Josephs Primary School and Churchill Primary School Caledon and the supporting expertise of Jonathan Ellis, Armagh Banbridge Craigavon parks manager. 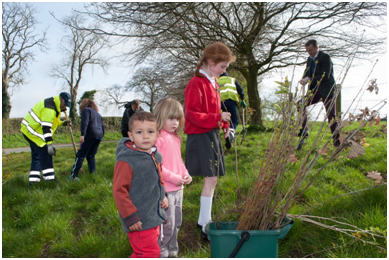 Today the first 1000 trees (of a total planting of 2,000) will be planted at the old Forkhill Barracks Forkhill following a reception to launch the project at 11.30am. These trees are sponsored by the Woodland Trust Northern Ireland. Old Forkhill is a former British military installation that is in the process of being converted for community use. Rebel Hill Castle Lake Forest Demesne, Bailieborough, Cavan Co. Cavan, Ireland. 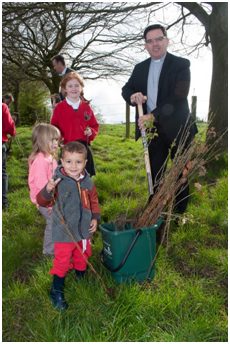 2,000 trees sponsored by Coillte will be planted consisting of 1,000 Oak, 500 Larch, 200 Scots Pine, 200 Hazel and 100 Holly. They will be planted on a 1.3ha plot. 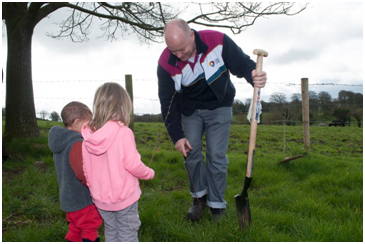 Planting organised by the Bailileborough Development Association will start at 12noon on Thursday 9th and finish at 6pm on Friday 10th (Finishing at 6 p.m. both evenings). 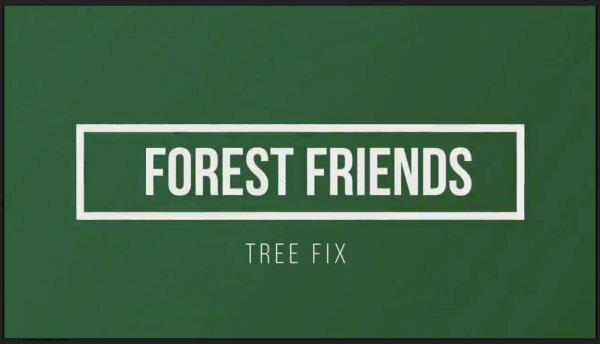 The Peace Forest Ireland Project 2017 contains two modules, the planting of 2,000 peace trees in the Castle Lake Demesne Bailiebourough, Co. Cavan and the planting of 2,000peace trees in Armagh Banbridge Craigavon, giving a total of 4,000 trees to be planted in remembrance of all those who lost their lives in the Northern Ireland conflict. The trees for the former are being sponsored by Coillte and in the case of the latter, the Woodland Trust Northern Ireland. The Peace Forest Ireland Project is envisaged as one of strengthening the Peace process and the principles based on the Good Friday Agreement. 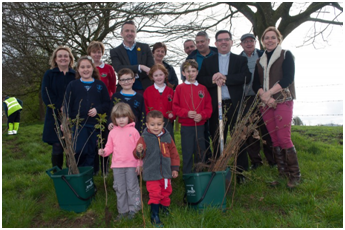 The project was launched in Derry/Londonderry in May 2014 and pilot tree plantings have taken place in each of the border counties since then. The idea is to continue various modules of the project on suitable sites, in different border counties over the widest time span. Forest Friends Ireland welcomes the document entitled “National Biodiversity Action Plan 2017-2021, which goes under the above title and notes its contents which have a bearing on forestry biodiversity. While we find it useful as a referencing document which could lead to a comprehensive scoping report, we do not see it in its present form as a plan in the case of the biodiversity of Forestry in Ireland. However there are certain parameters which together with others not identified within which a plan could evolve. We find that the document is unnecessarily repetitive, utilising at times excessive jargon and tends to be aspirational rather than task based. With regard to Forestry a biodiversity plan should set out a number of possible approaches optimising biodiversity and should address all the parameter, however briefly, or in summary, including the following. Our submission identifies issues which we feel a biodiversity plan should deal with comprehensively. 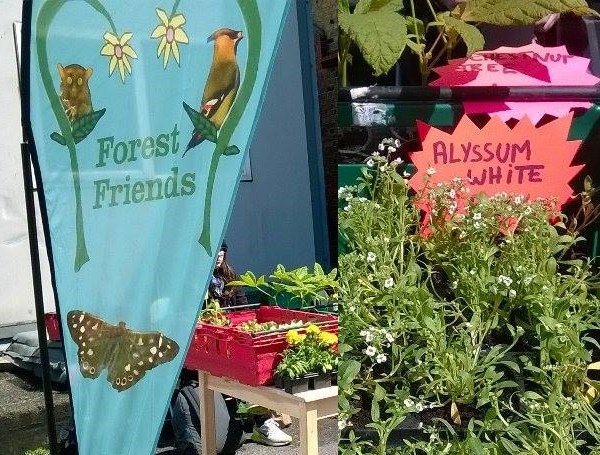 Forest Friends can now get your garden ready for summer - plants, herbs, flowers and more. everyday between 1pm and 2pm. The project also envisages the creation of a Centre of Forest Biodiversity, based on best practice in Horticulture Silva culture and Permaculture; a centre for environmental education, incorporating visitor centre, existing natural woodlands, new tree planting, using 100% native species, commemorative trees, woodcrafts, maximising community involvement; Ogham groves based on the Celtic tree alphabet; tree nursery. The centre envisaged will be held in trust in perpetuity for community benefit. 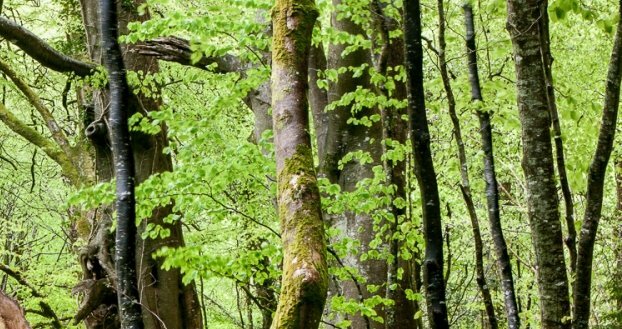 This Woodland Cross-border Peace Project with Northern Ireland and Republic of Ireland will promote forest skills, a culture of trees and forests, capacity building and community development. The project is not designed to interfere with the structures and practice of farming as existing but to be complementary to them. It is intended to enhance rather than damage local landscapes. To assist the design of the project and its planning the elements incorporated in the Auroville Peace Centre in Tamil Nadu India will be examined. 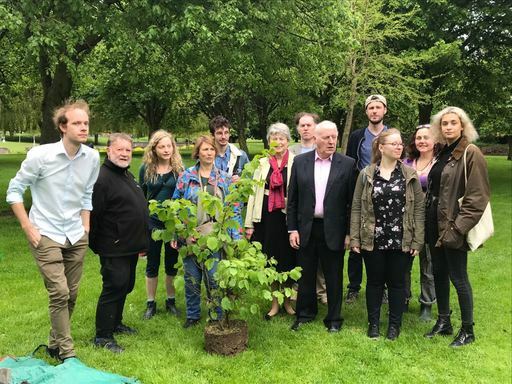 The 2016 module of the Peace Forest Project involves the planting of 4,000 commemorative peace trees in memory of all those who lost their lives in the Northern Ireland conflict- This will be done by a process of liaising with all groups in the border counties in order to involve them in the project. 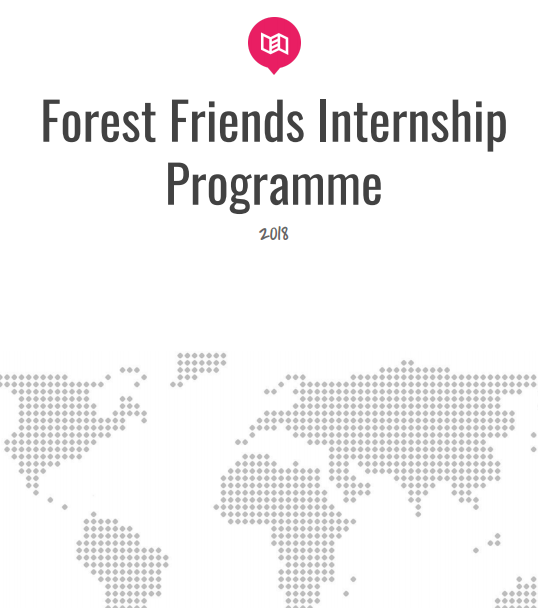 To assist the process of planning and development of this module of the peace forest, advertising will be placed in the local newspapers in each Border County explaining what are envisaged and inviting ideas, and promoting involvement and support. Partnerships will be encouraged to assist all aspects and stages of the peace forest project, and to assist in the sourcing of suitable sites. The overall project is ongoing in short, medium and long terms. The potential of the project is very significant in terms of climate change. The Tree Council or Ireland has donated five hundred trees, and the Woodland Trust Northern Ireland is making 2,000 trees available. Thank you for supporting Forest Friends Ireland. I am in the dry north of Ghana.I have identified hill forest that offers green life.the forest has wild fruit and medicinal plants serving as food and income for local people.